Texas A&M is conducting research into the idea of a using a slingshot technique to throw space junk into a decay orbit. 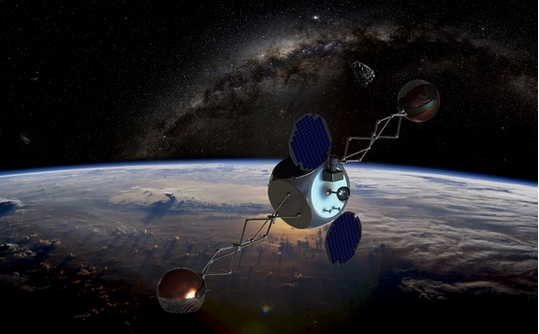 The slingshot satellite, or Sling-Sat as they’ve named it, would intercept a piece of space debris, “catch” it, and then “throw” it back towards the Earth and into a decay orbit. The Sling-Sat would absorb the momentum of the piece of debris while catching it and would thus be provided with a very beneficial and energy-saving boost, which would propel the Sling-Sat towards its next target. The Sling-Sat would be provided with a secondary boost while “throwing” the piece of debris towards the earth– a Newtonian opposite-reaction. This proposed debris-capturing device would also feature retractable arms, which would allow it to adjust its rotational speed. Making use of the object’s momentum to save propellant/energy. Converting the object’s momentum into smaller-arc angular momentum. Hopefully the transfer from (relatively) linear to angular momentum would also help reduce the amount of kinetic energy exerted on the capturing device. Using the reactionary momentum from the “throw” to propel the capturing device towards its next target. If the piece of debris is at too high velocity relative to the capturing device, then the outcome of the impact, or “catching”, is likely to be disastrous and counter-productive (creating more space junk). Throwing the debris into a decay orbit to burn up on re-entry is a rather wasteful goal. It would be better if the resources within the debris could be captured and utilized (the metals, propellant, technology, etc.). After “catching” a piece of orbital debris, the capturing device may still require a substantial amount of energy to stabilize and orient itself properly to “throw” the object into a decay orbit. Overall, it is an intriguing an idea that is worth some thought. I believe some of the concepts it brings to light may be useful in design of the final Space Junkmobile.